Leading usual saamsaarika-jeevam, but not being involved in the bhogas (materialistic pleasures) and attaining Moksham is the speciality Bhaarateeyas. Bhaarateeyas do Karma but only with Krutagnyataa-buddhi, paropakaara-buddhi and Vairaagyam. Priya Vrata’s story stands as a nice example for this. Priya Vrata was the putra of Svaayambhuva Manu (the first Manu of the current day of Brahmadeva. See this to know our Kaala-maanam). Due to Priya Vrata’s adrushtam, Naarada maharshi came and gave Adhyaamtma-vidyaa-daanam to him. Though Svaayambhuva Manu wanted to make Priya Vrata the King, seeing his Dharma-buddhi, Priya Vrata was not at all interested in the Bhoga-bhaagyas of a King and went to pavitra Gandhamaadana Parvatas (where Paandavas spent part of their Aranya-vaasam) and did Tapas with great Nishtha. Brahmadeva appeared before Priya Vrata and said “being a Gruhastha and having Aatma-gnyaanam, one can attain Moksham. Similar to how one does archana of Durga Devi for Shatru-jayam, a Mokshaarthi can be in Gruhasthaashramam and do Shri Naaraayana Naama Smarana, win the arishadvargas and attain Moksham in the end. Hence you do your Kartvayam of Raajya-paalana, never forget Hari-bhajana and thus get Moksham”. Following the Brahmadeva’s aagnya, Priya Vrata then went back to his father. Svaayambhuva Manu did Raajyaabhishekam of Priya Vrata and took Vaanaprastham to do Tapas. Priya Vrata did Kalyaanam with Barhishmati, the putirka of Vishvakarma and did Dharma-paalanam of his Raajyam, never being invloved in the sukhas and never forgeting Bhagavat-dhyaanam. All putras of Priya Vrata and Barhishmati became great Vishnu Bhaktas. Three of them left to forests for Tapas and reached Parameshvara-sannidhi. One day Priya Vrata got this thought: “we know Suurya-deva goes around Meru and the other side will have darkness. Why did not anyone try giving light to the other side?”. He thought “why not me?”. He immediately, with his Tapas-shakti, aboarded a Divya-ratham and started going opposite of Suurya-deva! People were surprised to see the second Surya. Because of this, the sapta-dveepams were formed on the Bhuu-madalam: Jambu-dveepam (here is our Pavitra Bhaarata-desham), Paksha, Kusha, Krauncha, Shauka, Shaalmali and Pushkara Dveepas. Also Sapta-saagaras were formed: Lavana, Ikshu, Sura, Aajya, Ksheera, Dadhi and Jala. Priya Vrata made his seven putras the Kings of the Sapta-dveepams. Priya Vrata then completely left his moham on the Raajyam, Bhaarya, putras and remembered the Aatma-vidya given to him by Shri Naarada maharshi and did Adhyaatma-satra-yaagam. He considered the sukhas in Bhuu, Svarga lokam as nothing and became more interested in Moksham. With nishkalmasha-hrudayam he always did Vishnu-dhyaanam and because of his Vishnu-bhakti reached Vaikuntham. The Vairaagya Buddhi of Bhaarateeyas is well shown in the story. They do their Kartavyam, but keeping in mind what is Satyam and never forget Bhagavat-dhyaanam. Priya Vrata, because of his paropakaara-buddhi, was able to use his Tapas-shakti to do adbhuta-kaaryams. He became an Apara-suurya and gave aanandam to many. Perhaps there will be no Bhaarateeya who did not hear about “Bhartruhari Subhaashitaani”. He was the Bhraata of the great Vikramaaditya maharaja. He was a great Samskruta kavi. In addition to Subhaashita-Ratnaavali, he wrote divya granthas like: “Vaakyapradeepam” (a vyaakarana grantham), “Raahata kaavyam”, “Kaarika” (Pantanjala mahabhaashya vyaakarana ruupam). Vararuchi, Vikramaaditya, Bhatti and Bhrartruhari were the priya-putras of Keshava Sharma. Bhrartruhari was made the King and he did Raajya-paalana around 135 years before Shaalivaahana Shakam. From childhood, Bhartruhari was always interested in Saadhu, Sajjana seva. Once a poor Braahmana in Bhrartruhari’s Raajyam did upaasana of Bhuvaneshvarii Maata. He knew sakala mantra-shaastras. Bhuvaneshvarii devi appeared before him and gave him a divya-phalam and said that whoever eats this phalam will not have jaraa-maranam (will not become old and be immortal). The Braahmana thought like this “I am a poor Braahmana. What rakshana of others can I do even by living for long. Anyway since I am Braahmana, I must do Bhiksha-aatana and eat. If I give this to the Raaja, he can do great seva to the praja and do their Rakshana”. Thinking like this he went to Bhartruhari and gave his aashiirvaadam, the divya-phalam and told its Mahima. However Bhartruhari gave it to his priyaa, Anangasena. She in turn gave it to her priya-sakha, an ashva-poshaka. The ashva-poshaka gave the divya-phalam to his daasi and she in turn gave to her priya, a Gopaalaka. The Gopaalaka gave the divya-phalam to his priyatama. She kept it in the basket in which she was carrying cattle-dung and was going through Raaja-viidhi to her house. To his surprise Bhrartruhari saw that the divya-phalam finally reached in such a place. He called her and got to know the entire story. Knowing what had happened, he got Virakti on samsaaram. He realized that everything is mithya and Bhagavat-bhakti is only shaashvatam. He then left for the aranyas to do Tapas, giving the Divya-phalam to Vikramaaditya. Aaha! Vidhi is great. Finally the phalam reached the person who deserved it. Bhartruhari then wrote Neetishatakam, Shrugaarashatakam and Vairaagyashatakam. He spent the rest of his life as a Viraagi doing Daiva-dhyaanam. Once, taking pity on an old Braahmana, Vikramaaditya gave away the divya-phalam to him! Paropakaara buddhi of Bhaarateeyas is well shown in this story through the Braahmana who did upaasana of Bhuvaneshvarii devi and the great Vikramaaditya maharaja. The Braahmana showed us what is Nishkaama Bhakti. Though Bhuvaneshvarii devi gave him the divya-phalam, he gave it to the King, who can protect many more. Saadhu, Sajjana seva, respecting elders are great sadgunas. Bhartruhari was always interested in them. Bharata was the putra of the great Dushyanta and Shakuntala. Kanva maharshi did the jaataka-karmaadi samskaaram of Bharata. Bharata was Shri Hari’s amsha and was a paraakramashaali. Right from his childhood he was a Balashaali. He used to catch ferocious lions and play with them in his childhood! Dushyanta did pattaabhishekam of Bharata and went to the forests for Tapas. After Dushyanta, Bharata did Dharma-paalanam of this entire Bhuumandalam. Bharata, the mahaa-yashasvi, became Chakravarti of the Sapta-dviipas. Since he is a Daiva-amsha-sambhuuta, his name will always be remembered. On his Dakshina hastam, Bharat had Chakra-chinham and on his legs had Padma-kosha Chinham. He did 55 Ashvamedha Yaagas in the Karma Bhuumi between Gangaa-Saagara-sangamam and Gangotpatti-sthaanam. Later, with Diirghatapasa as Purohita, on the Yamunaa-tiiram, Bharata did 78 Ashvamedha Yaagas! A collection 13084 Gomaata (cows) is called as “Dvandvam”. Bharata did “Dvandvam” daanam, along with the calfs, decorated with golden ornaments, to 1000 Viprottamas. During “Mashnaara” Yagnyam, he gave daanam of 1400000 Gajas (elephants), along with suvarnam (gold). Panditas say that, there has been none before and will be none after Bharata who did such adbhuta daanams! Bharata was a great Dhairya, Paraakrama-shaali. During the course of the Ashvamedha Yaagams, Bharata caught 3300 ashvas and surprised the Kings! 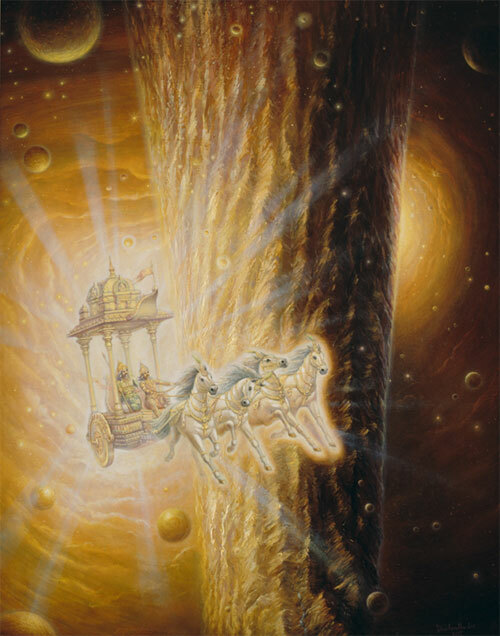 Bharata did dushta-samhaaram — he did vadha of Kiraata, Huuna, Yavana, Poundra, Kanku, Khashu, Shaku, Mlechchha and other Sanaata-Dharma-viruddha Raajas. Long ago, the asuras once defeated the Devatas, took away the Devata-striis and hid them in Rasaatalam. Bharata saved all of them and returned them to the Devatas. During his rule, both Svargam and Pruthvi used to give whatever the praja wanted. The daana, paropakaara gunams of Bharata must be cultivated by all of us. People say a person who did so many divya-kaaaryas never ever existed or will ever exist (Na bhuuto na bhavishyati). Though Bharata had Paraakramam and Dhairyam, he did not do Yuddhams with Raajya, Dhana Kaanksha. He killed Kings who are against Sanaata-dharmam and did Dharma-sthaapana. The Vairaagya buddhi of Bhaarateeyas is well displayed in this story. They do Karma, but never are interested in the materialistic benifits of it and do it with Paropakaara-bhaavana. It is indeed our adrushtam to be born as Bhaarateeyas. Bhaarata-desham is the only Karma-bhuumi. Hence, though Bharata ruled entire Bhuumandalam, he did all the Yaagas, Yagnyams, Vratams in this Karma-bhuumi only. As told in many of the previous stories, there are many Divya-kshetras, Siddha-pradeshas, Siddha-aashramams in this Bhaarata Desham. After the great Rushabha maharaja, one of the 21 important avatars of Mahaavishnu, His prathama putra, Bharata, did Raajya-paalanam of this Bhuumandalam very well. He followed his ancestors and never deviated from the path of Dharma and Satyam, with the anugraham of Shri Hari and Viprottamas. Before Bharata, this Bhuubhaagam used to be known as “Ajanaabha”. Because Bharata ruled it, it got the name BHAARATA VARSHAM. During that time a Raaja by name Vishvaruupa, who was like Chandra in the group of Kings, used to be there. His putrika was Panchajani. Bharata, in a su-muhuurtam, did Kalyaanam with Panchajani. Similar to how Panchatanmaatras (Shabdam, Sparsha, Ruupam, Rasam, Gandham) are born out of Ahankaaram, Bharata had five putras — Sumati (Indradyumna was the putra of Sumati), Raashtra-bhrutt, Sudarshana, Aacharana, Dhuumraketu through Panchajani. Bharata also did many Yagnyas, Yaagas for the benifit of his Raajyam and praja. He did all the satkarmas which need to be done at Amaavaasya and Pournima. He did all Agnihotras that are supposed to be done in Chaaturmaasyams. He did many Pashuyaagams, Somayaagams and did many great Daanams in them. As recommended by our Shaastras, he never did any of these Karmas with Svaartham and did “Parameshvara-arpanam” of these Karmas. Thinking about the greatness of Paramaatma, with Bhaktimaya-Hrudayam, he used to do Raajya-paalana. He then divided his Raajyam among his 5 putras, left ananta-aishvaryam, palaces and other Bhogas and left for Pulaha-aashramam. In search of Mukti-maargam, with Vairaagyam, he left his house, sons and all bhogas and took Vaanaprastham. Though it was difficult to leave his sons and go away, knowing that all what we see is nothing but Vishnu-maaya, he controlled himself and left for Tapas at Pulaha-aashramam. Shrimannaaraayana, in pratyaksha-ruupam, stays at Pulaha-aashramam and blesses the Bhaktas. The great Gandakii-nadii, which has many Saalagraamams, flows just beside Pulaha-aashramam. Staying there alone, Bharata did ekaanta-seva of Srimannaaraayana. He used to do Archana of Mahaavishnu with Pushpam, Toyam, Tulasi-dalam, Tiirtha-jalam, Kamalam, Phalam. Because of Bhagavat-bhakti, slowly he lost all his desires, stayed away from arishadvargas and gained Shama-Dama aadi gunas. He used to experience Paramaanandam. One day Bharata as usual was doing snaanam in Gandakii-nadii. He stood in water and did Pranava-japam for 3 Muhuurta-kaalam. Then a deer, who was pregnant, came and started drinking water from the Nadi. Suddenly it heard the heart-breaking roar of a lion and with fright it tried to jump. Due to the fear, the baby deer fell out and the mother deer hit a near by stone and died. Bharata took pity on the helpless baby deer and started doing poshana of it. He knew that it is his duty and a Punya kaaryam to save the life of a deer. However Bharata slowly became more and more attracted towards it. He used to always think about it — while sitting, sleeping, taking bath, collecting Samidhas, fruits, leaves, while bringing water, during Daiva-praarthana. Even during Japam he used to think about the deer! He used to always protect the deer from wild animals. Slowly he left doing Dhyaanam, forgot his dina-charya, Nitya-karma. He forgot the very reason why he left his Raajyam, sons, Bhogas etc. and came to the forests. Though he left Moham of the Raajya-bhogas, he developed greater Moham on the deer. Aaha! Karma-bandham is great. Finally, the day when Bharata had to leave his physical body came. While leaving his praanam, he looked at the deer as his own son. He was only thinking about the deer and left his life. As a result, in his next janma he was born as a deer. However because of his ananta-Punyam, he had poorva-janma-smruti. One must have Satya-nishtha, Dharma-Diiksha and Bhagavat-bhakti. With these Satgunas, Bharata was able to rule the Bhaarata Varsham for a very long time and gained ananta-keerti. The Vairaagya buddhi of Bhaarateeyas and greatness of our Saampradaayam is shown in this story, through the Vaanaprastha-aashramam. People used to leave all the materialistic bhogas etc. and search for Moksha maargam. Vishnu-maaya is great. We must always be careful and do Karma, but not being interested in the materialistic aspects of it. Even for the great Bharata controlling Moham was difficult.